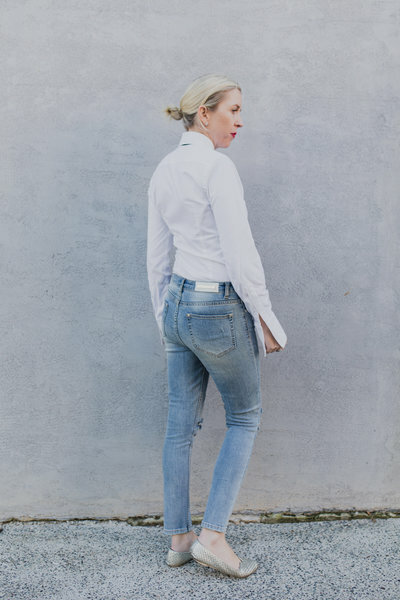 A great pair of jeans is a wardrobe staple in everyone's wardrobes becuase they can easily be worn in the day or dressed up with a great pair of heels to take you into the night. The great thing about jeans is once you have found a pair you love you can wear anything with them from casual T-shirts for the day to silk tops for night and everything in between. 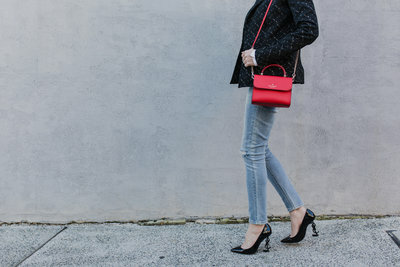 Transitioning from day to night can be as simple as popping on the heels and opting for a smaller bag which is more evening approproate. 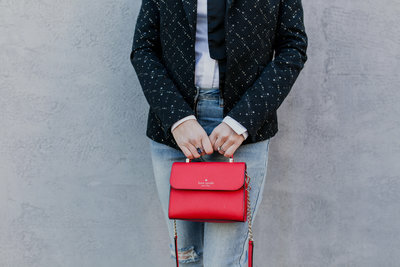 Small bags, clutches and small cross body bags are great for evening looks. In terms of heels you can wear any heels with jeans but make sure that it ties in with your look. For the day look I am wearing some silver leather flats from Alexander McQueen and a bag from Status Agency. I love this bag because it's a colour that I can wear with everything and it fits everything I need for a day of styling including by notepad and waterbottle. For my evening look I popped on my favourite YSL 'Opyum' pumps and a great little red handbag from Kate Spade. When I wear these heels I feel like I can conquer anything! If you would like some help in taking your day look to night then please consult your Style Doctor.